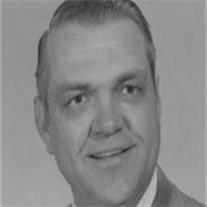 Johnson, Frederick G., Jr., age 80, of Mesa, Arizona, passed away on August 6, 2010, after a courageous battle with cancer. Fred was born in Phoenix on May 6, 1930, the first child of Frederick Sr. and Ruth (Hatch) Johnson. A descendant of Benjamin Franklin Johnson, he was a 5th generation member of this Mesa pioneer family. He was preceded in death by his parents, a brother Laurence, a sister Karen, and a grandson Nathanael. He is survived by his devoted wife of 58 years, Marjorie K. (Guinn) Johnson; siblings E. Lee Johnson (Dianne) of Spanish Fork, UT, Jo Ann Pew (Gerald) of Lehi, UT, and Bruce Johnson (Gay) of Gilbert; his six sons McKay (Sue Anne), Lee (Elizabeth), Bryn (Lee Ann), Erin (Ginger), Webb (Vachelle), and Jared (Vickie); 23 grandchildren, and 16 great-grandchildren. A devout and life-long member of the Church of Jesus Christ of Latter-day Saints, he served a two year mission in 1950-52. Throughout his life he accepted numerous church callings, including Bishop, High Councilman, Ward Clerk, and Temple worker. He was active in many community organizations, including Rotary, Optimists, and Lions clubs, various school committees, and the Boy Scouts. He served in the U.S. Air Force during the Korean War. While working full time and helping to raise his sons, he graduated from Arizona State University in 1958 near the top of his class with a BS in Accounting. He was licensed as a Certified Public Accountant, and had a long and productive career in accounting. Visitation will be from 6 to 8 pm, Wednesday, August 11, at Bunker’s Garden Chapel 33 N. Centennial Way, Mesa AZ 85201 (telephone 480-696-6883). His funeral service will be at 10 am on Thursday, August 12, at the LDS Beverly Ward Chapel, 1054 W. 2nd Place, Mesa AZ 85201.